Most homeowners do not have lots of experience with whole house humidifiers. Maybe you have had the smaller ones for the baby’s room, but nothing more than that. The best whole house humidifier makes a difference in your overall life quality and health, especially in winter when the air is dry. A humidifier, therefore, is an essential addition for keeping respiratory problems at bay. A whole house humidifier is not an investment in vain. It provides you with lots of benefits, either during winter or summer. Increasing the moisture levels reduces instances of certain airborne infections, enhances your comfort and overall pleasure. Here are those benefits you stand to gain. Maintaining the right humidity level alleviates stuffy sinuses as well as improving breathing. Moist air provides relief to asthmatic homeowners or those with respiratory problems. You would experience reduced cases of allergies as filters trap allergens in the air. Increasing humidity helps nourish indoor plants. They help prevent hardwood floors and indoor furniture from developing cracks or shrinking. 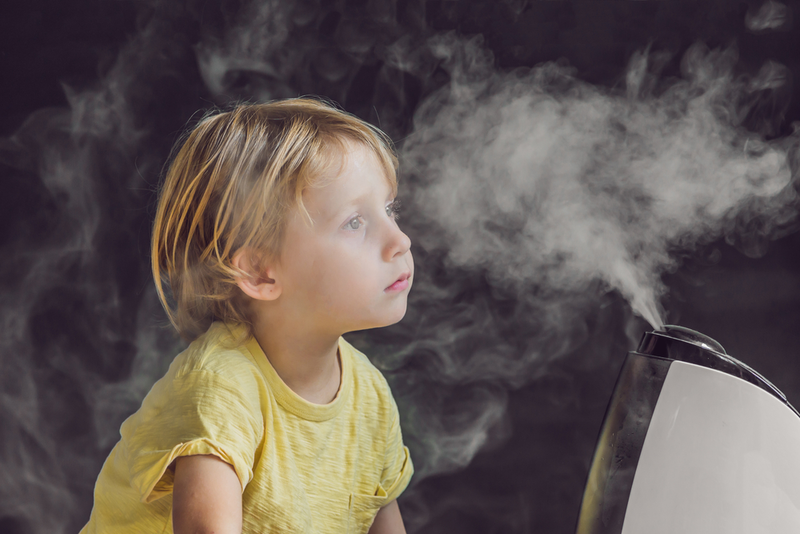 Humidifiers eliminate dry air that harbors bacteria and viruses that make your family sick. High humidity lessens instances of static shock. 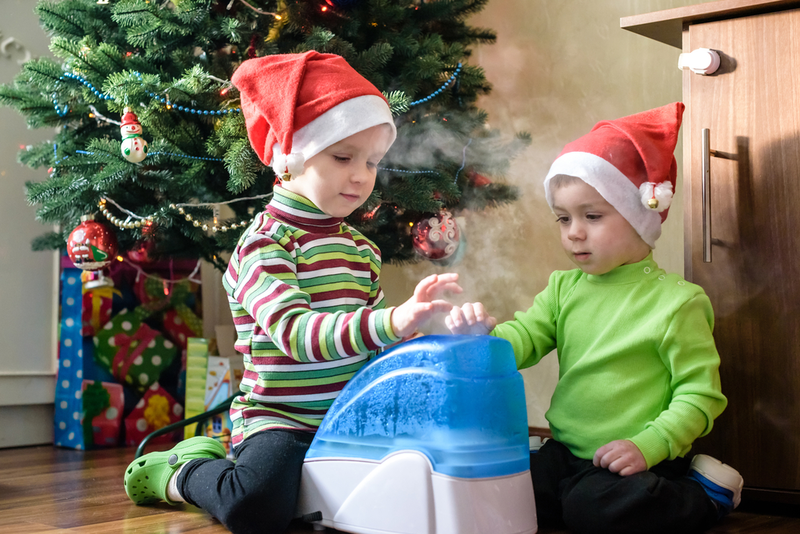 The lights and buzzing sounds of some humidifiers has been shown to help babies sleep better. There are a lot of whole house humidifiers out there. And with modern advertising gimmicks, each of these claims to be the best for you in one way or another. To ensure you end up with the best product, there are certain factors that you have to consider. Every whole house humidifier has its own specification on how much room size it can effectively moisturize. In fact, even those that you would connect to your HVAC system at home have limits beyond which they become ineffective. Before you buy any of these, check the square feet coverage that is specified on it. Then compare this with the size of your house and give allowances. The allowance you provide also depends on whether your house has a high ceiling or one of those open floor plans. It is always a good idea to look for a unit with bigger specs than your house so that it becomes more effective than if it were exact. In as much as you would want to keep the air in your house humid, you also don’t want your electricity bills skyrocketing. If you are looking to save on your bills (which we believe you do), then look for an energy efficient product. Check the power ratings, or if they have an energy efficiency certification. However, if that proves too hard, then you are in luck. The products we have provided you are very energy efficient. This would make it easier for you to choose one. Noise is another key consideration that you will have to make. Some of the models in the market tend to be quite noisy and irritating, more so at night. But since you would want the device to be operating and not make noise at the same time, look for one with reduced noise levels. Most of the options around have speed settings which determine the noise levels generated. At lower speeds, humidifier fans typically whisper. They only become loud when you crank the speed up for mistier vapor. All in all, consider one with the least noise level available. It would be of great convenience to you. 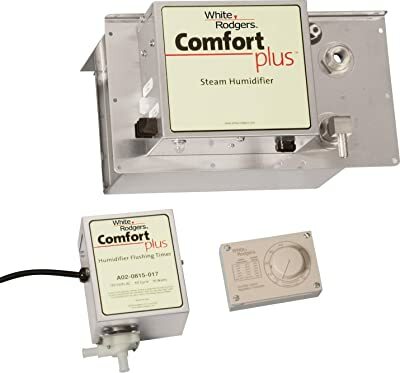 Various types of whole house humidifiers have a varying degree of maintenance requirements. Some are easier to maintain (annually) while some need at least changing of filters after a couple of weeks. Check the manufacturer’s instructions on the frequency of cleaning or maintaining the device and what you need to change. If you are okay with the terms, then go for it. It shouldn’t be too costly to maintain one as it would overshow its benefits to you. In other instances, you need a device that is easy to use. It shouldn’t be a struggle setting the desired humidity level or changing a setting. One with intuitive digital controls or LED displays would be great for you. This is another feature that contributes to the ease of use of a humidifier. Therefore, it would be a smart idea to check whether the device can be automated so that it goes on or off when it reaches below or above the specified percentages. There are options that combine both manual and automation. The choice you make is a matter of preference so long as it works expeditely. After getting the buying step right, you need to correctly use and maintain your humidifier so as to get the very best out of it. In order to keep your unit running in top conditions, keep these in mind. Check the water flow inside the solenoid (if it has one). Improper water flow could potentially reduce the effectiveness of the system resulting in higher energy costs. 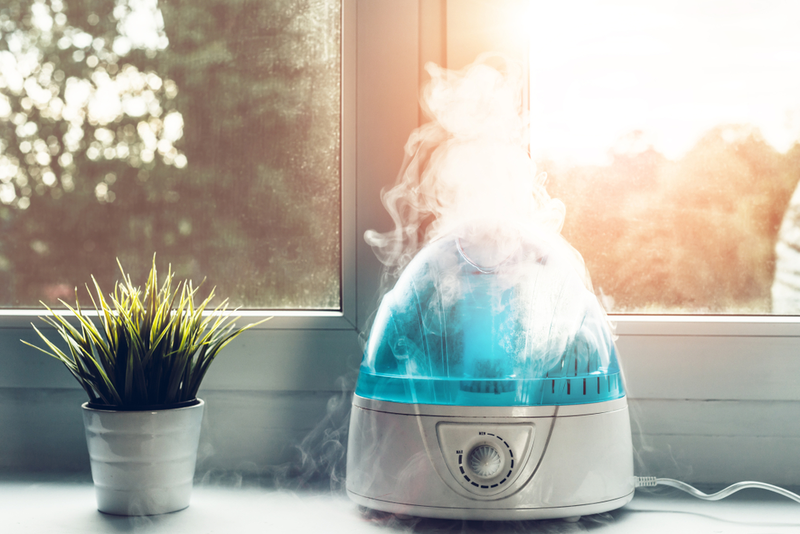 If you are buying a whole house humidifier for the first time, you need to take care to ensure that you end up with the best. It is the only way of getting rid of the dry air cramping in your living room. To make this hunt easier for you, we have compiled a detailed review of 10 of the best whole house humidifiers. They are functional, perform to the optimum, and won’t break down with ease. 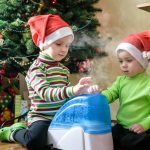 This whole house humidifier is one of the best and popular options you can find around. It is a console type of humidifier that uses the evaporative technique to keep your whole house misty. As a standalone, it delivers cool mist throughout the house or an area of up to 3,600 square feet. Such an area is decent enough to cover your whole house, provided it measures that size in total. For accurate functionality, this product has a digital humidistat. It is a feature that maintains the desired levels of humidity in your house. The set levels are maintained with digital accuracy. Another great feature is the ability to shut itself off when the desired humidity levels have been reached. When the humidity in the air falls back to below the set levels, it turns back on. The device also automatically goes off when the unit becomes empty. This ensures your safety. Cleaning a humidifier can be a handful at times, but not this unit. It features a unique design that is quite easy to clean. There are evaporative wicks on it that trap mineral deposits from the water used for an easier cleaning. Since it has no turning wheels, belts or pulleys, the unit smoothly runs while in operation. If you own a relatively small sized house, about 1,000 square feet in size, then this product would be a great choice. Its design consists of deep pitch blades that suction dry air from your living room into the unit. Then, using a vortex action, it re-circulates mist humid air back into the air. Featuring a considerably large 4 gallons tank capacity, this humidifier allows for longer uninterrupted operations with fewer refills in between. As a result, the unit can run continuously for 24 hours without stopping. This product has a humidistat fitted into its design. Using the knob provided, you can set the humidity levels to either Maximum or minimum by turning the knob between these two settings. In return, the unit continues to run as long as the tank isn’t empty and the desired humidity is attained. To give you a more convenient runtime, this product has a 3-speed fan setting. For a larger room, set it at “high” to quickly humidify the room, “medium” for moderate operation and “low” for a quiet operation. The low speed comes in handy at night or when in a smaller room. The EP9 800 is one of the best whole house humidifiers currently available on the market. It is a great choice for those of you with large sized houses, with space sizes of up to 2,400 square feet. A pedestal style of design makes it an excellent choice for ridding your home of dry air. After assembly, the whole set up weighs about 27 pounds. This is not much as you can still move it about in the house. With its digital display, the exact humidity level, your desired humidity settings, and fan speed are displayed. 9 fan speed settings allow for an increased level of customizability. It is a great feature as it enables you to select the exact fan speed depending on how big or small your home is. 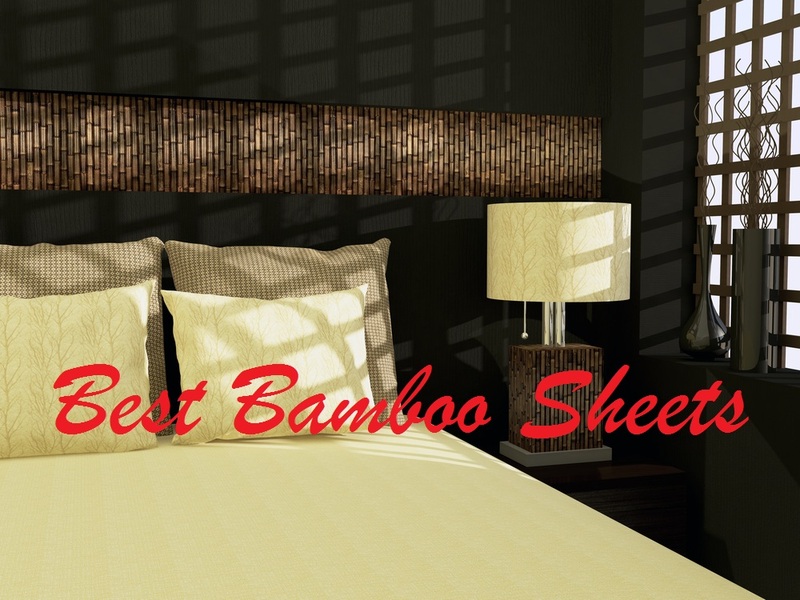 At night, you are able to lower the speeds for a quieter runtime as you sleep. 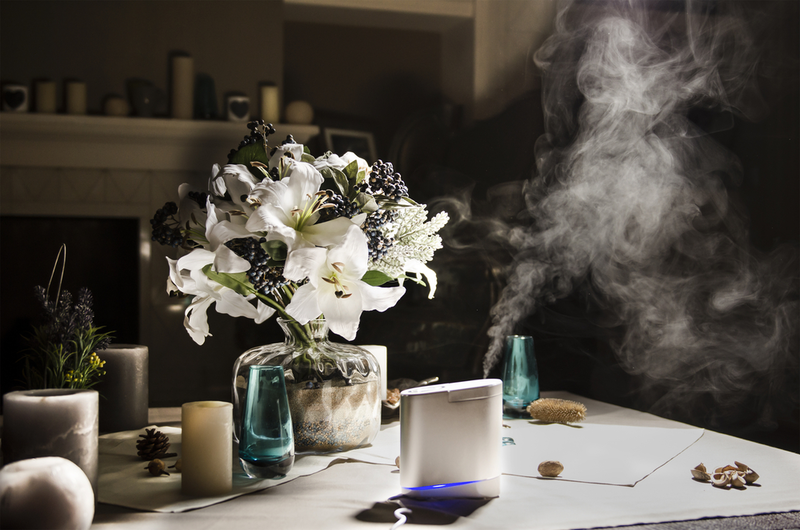 Fitted with a digital humidistat, the unit maintains the humidity level that you set automatically. You can set these on the digital display. When water runs out, or when the set humidity level is reached, the unit automatically shuts down. If you are looking for a humidifier for just a single room and not the whole house, then this is a great option. It could be either your bedroom, an office or the baby’s room. A large 5 liters capacity tank emits cool water vapor throughout the night. Aesthetics is another great feature. The matte black finish makes it a great addition to your living space, or when used for decorative purposes. With this device, long pressing on its power button activates the sleep mode. The indicator light switches off and turns to a moderate mist output. Operation modes can be toggled between low, middle, and high-performance modes. Your choice would then depend on how much mist you need at that particular time. Runtimes usually range between 14 and 17 hours, depending on the desired running mode. A safety function addition turns the device off when water runs out. This feature ensures it doesn’t overheat or short circuit in the process. A single power button provides easy usage. There are no buttons to fumble with. 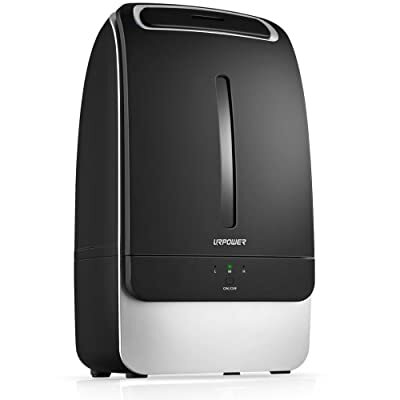 This humidifier is one of the best for a whole house in case you have respiratory problems or if you are having trouble with allergies. Its design has in place a pure filter which removes pollutants and toxins from the air before recirculating this air back. In turn, you have a cleaner air to breathe. 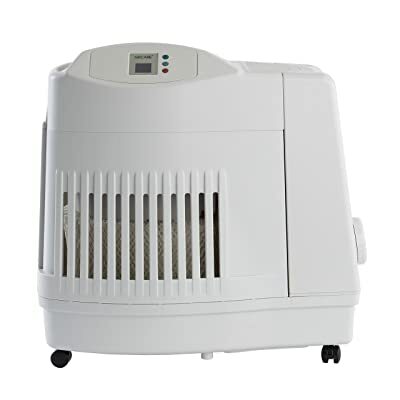 The system is 120 volts powered steam humidifier which is a unique deflection from the usual evaporative humidifiers in this list. 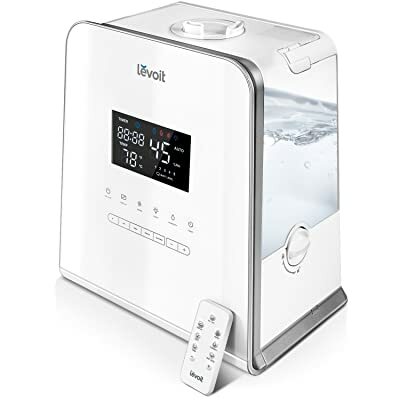 One of the good features about this unit is the humidistat that perpetually monitors the dryness of the air in your home, then kicking on or off the unit. Whether yours is a residential or an industrial business premise, you can install this humidifier for a healthy breathing air. You have an option of a flushing timer that mechanically eliminates previous water that was in the system. Moreover, this humidifier has a knob which is great for choosing how much humidity you need in your home. Total output is rated at 13 gallons of water per day. Such amounts are great for large-sized premises or those who need massive quantities of moist air. 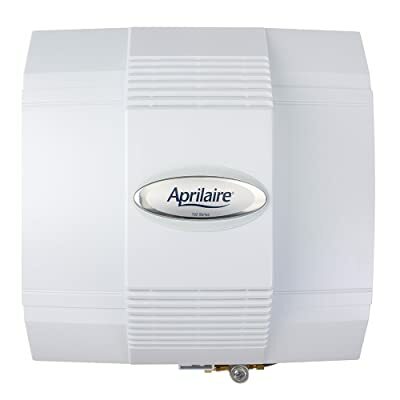 The Aprilaire 600 is one of the best whole house humidifiers currently available. It is an appliance that best suits large rooms, with a range of up to 4,000 square feet. Therefore, if this capability meets your requirements, then this appliance would be a great choice. Aprilaire 600 is easy to maintain and use since it comes with control features you can use to make the various adjustments. This model has a bypass damper integrated on to it. It is a feature that increases the product adaptability for either winter or summer applications. The tricky thing about this humidifier is in its installation. A flow-through humidifier usually requires a professional contractor for the job if you want the best results. But once up and about, you will enjoy up to 0.7 gallons of evaporated moisture every hour. It is incredibly compact, which lowers its weight to about 11 pounds. It has a 3-gallon capacity water tank which works for about an hour to raise the humidity levels of your large-sized home. Therefore, it is an efficient and effective humidifier for your whole house. 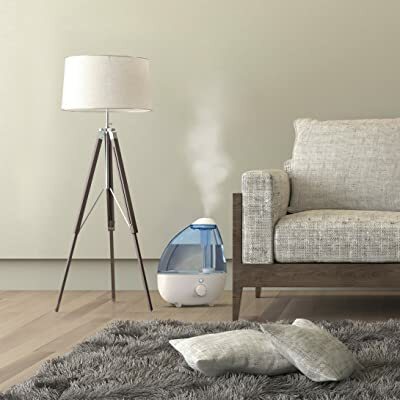 This humidifier gives an extra capability of being able to spread a sweet aroma in your house. This is alongside the humidification features. 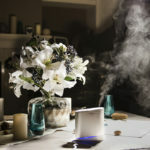 Add essential oil drops into the aroma box provided and let the appliance spread the sweet scent into the air. A large 5.5 liters capacity is great for sizeable rooms. Such an amount of water makes it possible for you to run it for up to 36 hours non-stop. The moist air generated then covers an area of 753 square feet. 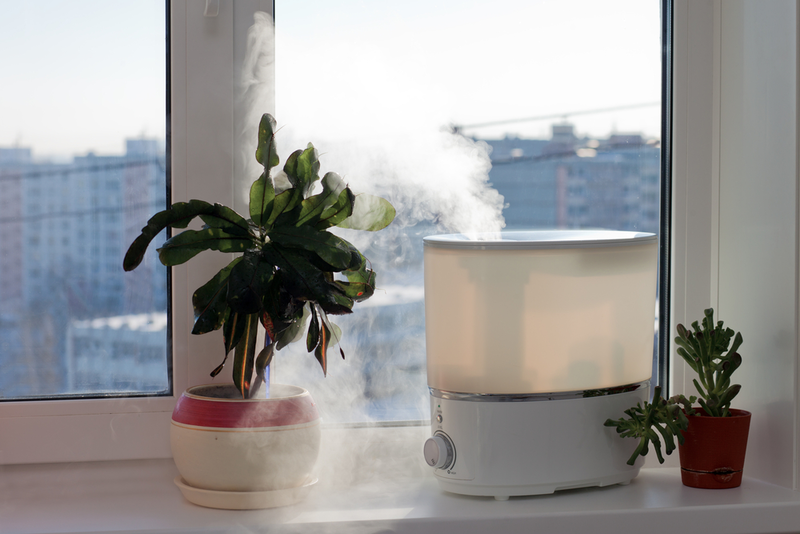 It’s a great size if you want the humidifier in your office, bedroom or living room alone. Humidifying rate of up to 450 ml/hr quickly moisturizes the dry air in your room. The output is dispersed through the dual 3600 nozzles that are adjustable for a more even mist distribution. An auto mode and a humidity sensor enable you to keep tabs on your surroundings. Based on the prevailing conditions, the relative humidity can be set to between 25 and 70 percent. Apart from the control panel on the appliance, there is an added advantage of remote access. Specifying humidity levels from 30-80% RH becomes easy in the process. 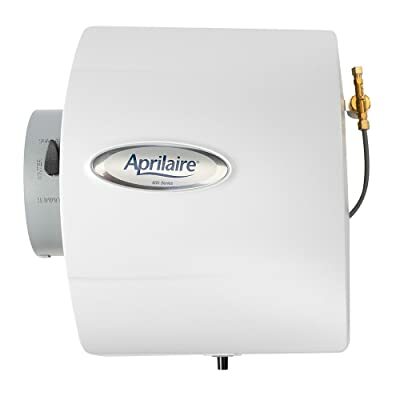 The 500 series is the smaller of the Aprilaire models of humidifiers. It is suitable for small to medium-sized houses, with a humidifying capacity of 3,000 square feet. If you need a product that balances between power consumption and capabilities then this unit does exactly that. Weighing only 10 pounds, it is a device that does not get in the way if you decide to install it in your house. The 500 series is designed to have a water feed rate of 3.0 gallons per hour. As a result, it produces 0.5 gallons per hour of water vapor due to its small size. Just like in the 600 model, this one also has a damper built it to regulate water feeds depending on the seasons. For the price you pay for this device, you get one with digital automatic controls as well as an outdoor sensor. Excellent humidification of medium houses of upto 3,000 sq. ft.
For those who are looking for a small sized option for the baby’s or toddler’s rooms, then the MistAireis an option worth checking out. It features a cool-mist technology which delivers a moisturizing performance for 10 to 24 hours when continuously running. This duration depends though on the mist control settings that you are using. You, baby and children, can then have a smooth sleeping time. For further comfort, an optional night light is available to relax your baby in their sleep. A single and dual mist output nozzle allows you to customize how the moisture is output from the appliance. On the side is a knob for varying moisture output to comfortable levels for you. The 1-gallon water tank keeps it spewing moisture for the specified time duration. In case the water runs out, the device automatically goes off to prevent overheating. Cleaning it is easy too since part of the package includes a disk cleaning brush and a user manual for the same. 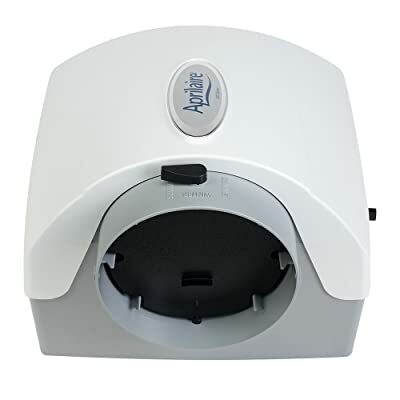 The Aprilaire 700 series humidifier is truly is one of the best humidifiers for your whole house. With an evaporation capacity of 0.75 gallons per hour, it is among the most powerful appliances out there. This much vapor is capable of moisturizing houses of up to 4,200 square feet in size. A generous reservoir capacity of about 18 gallons and a device weight of about 15 pounds make this product a true value for its price. Since it does not have an installation kit, you have to be well adept in DIY to pull off the installation. Otherwise, you are better off with a professional. Intuitive control buttons are provided for precisely determining the humidity levels required in the house. These are then displayed on its LED screen. Depending on how much you need the air to be humid, you can tweak between high, medium and whisper levels. The latter eliminates buzzing at night when you need minimal disturbance in your sleep. After a successful installation, the 700 series requires minimal maintenance. An annual service is all it needs to operate smoothly. 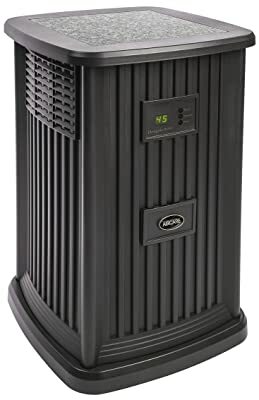 A whole house humidifier is an essential addition to your house especially in winter when the air is dry and cold. By moisturizing the air in your home, you become less susceptible to allergens, toxins, and respiratory infections. It is, therefore, an investment in your health that’s worth making. 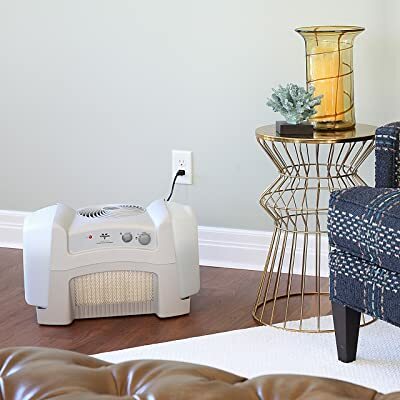 In this review roundup, our top pick for the best whole house humidifier is the Aprilaire 700 Automatic Humidifier. With its moisture coverage range of 4,200 square feet, it can probably serve most multi-floor houses. The impressive 0.75 gallons per hour of moisture output is the best in this list. Apart from the difficulty in installing one, the rest of the maintenance job is straightforward. In fact, you only have to check on it annually. The noise levels produced when in operation are almost non-existent with the device being energy efficient and easy to use. These are the features that make it our top choice.